If you want your site to show up in search engines (and you want people to actually click on it), you need to consider your meta descriptions. A meta description is the paragraph of text that describes your web page’s content in the search engine results page. The meta title is the clickable title above that description. In general, when you enter these for your website, they show up only in search engine results, nowhere on the site itself. Whatever you call them, meta descriptions are important. This is the first interaction a searcher has with your brand and website. It’s what helps them decide if they click on your listing or someone else’s. Where Do Meta Descriptions/Search Engine Descriptions Come From? Meta titles and descriptions are either written and entered by you, or automatically generated by the search engine. Most website platforms have a way for you to enter meta titles and descriptions for each page. It may be in the page’s settings or a settings box on the page editor. This varies a lot depending on which platform you use. I’ll include instructions for writing meta descriptions in WordPress and Squarespace below. But what if you don’t enter a custom meta title and description? Your website may still show up in search results, but the search engine will default to pulling in information from the page itself. This may be decent information, but it may also be garblygoop. Check out this website’s automatically generated meta title and description. Would you want to click on this? The website owner has definitely not entered a meta description there and left it to Google to figure out what to display. What a mess. In contrast—Would you be more likely to click on this result, where the company has clearly entered a meta description and made sure it reads well? I bet the second result here is more compelling for you and most searchers to click. So it’s important that for your key pages and posts that you enter what you’d like to show in search engine results. As a heads up, even if you enter a meta description for your page, that doesn’t mean that Google has to show it. Google wants to help their searchers find the most helpful pages possible. That means that sometimes, their robots might decide that a different description for your page would be more helpful for the searcher. So they’ll override your description. In a 2017 study, Moz found that meta description tags were used 35.9% of the time, and Google generated a description the rest of the time. I have found with wedding-related websites, this is much higher, so I still highly recommend writing a custom meta description. Do I Have to Write A Meta Description For Every Page? No, I’m not saying that you have to go back to each one of your pages and posts and write a beautiful, compelling, amazing description for it. Would that be awesome? Sure. But I know that could take forever. You might also consider doing a search for your own business name and seeing which pages Google chooses to show. If Google is displaying them, you want to make sure the descriptions are good. Writing custom meta descriptions for important blog posts is also a good idea. If you have a blog post that you want to rank in search, spend a few minutes on a good, compelling meta description. If you want your home page to rank for “Wedding Florist in Greenville TN,” include that keyword phrase in the meta title and description. Don’t force it, though. Find a way to weave it in naturally into the title and into a sentence in the meta description. And don’t use it on every page. You’ve got the space, use it! How long should meta descriptions be? Experts recommend around 155 characters (not exceeding 170). To make sure I’m using the space well, I use the Yoast SEO plugin’s snippet preview for WordPress. If I’m not working on a WordPress site, I write my titles and descriptions in SERPsim to test what they will look like on Google. Be creative! The meta description is the first opportunity to sell and get attention. Include what makes you different or unique—Don’t just try to use as many keywords as possible. I’m seriously in love with the Snippet preview section, which shows you your meta title and description exactly how it would look on the Google search engine results page. This means you know just how much to write. Meta descriptions on Squarespace are a little harder to find. Note that they may also show up on the website page itself, so be careful to check your pages after you enter your descriptions. 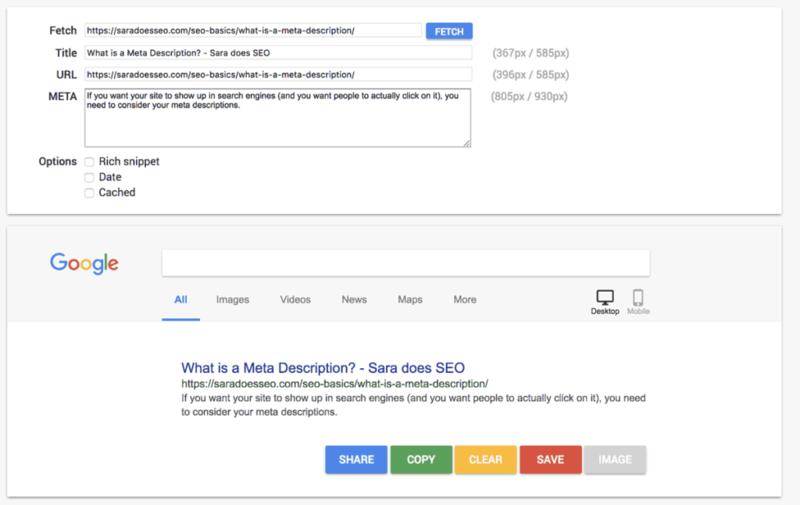 Need some help with meta descriptions? I’d be happy to write them for you in an SEO Intensive.